soon-to-burgeon field of television animation, the main reason he approached Ward as a business partner was because Ward, having succeeded his first career, had money to invest. Anderson had already been turned down by animation mogul Paul Terry (his uncle, incidentally). Never an innovator, Terry saw no reason to seek out a new market — the old one, neighborhood movie theaters, was a fine place to sell cartoons. Terry wound up selling out to CBS a few years later; but meanwhile, it's just as well he passed on the project, because if he hadn't, Jay Ward would never have gotten into animation. Ward brought more than mere investment capital to the table. He became intimately involved with development and production. When their first cartoon (titled The Comic Strips of Television) was broadcast in 1948, it was at least as much Ward's creation as Anderson's. The Comic Strips of Television was a vehicle for test-marketing some of the characters they'd come up with — Crusader Rabbit, Hamhock Jones and Dudley Do-Right. Nothing was ever done with Hamhock Jones, and Dudley Do-Right stayed on the shelf until 1961, but Crusader Rabbit went into regular production. Tho the networks all turned it down, it was sold on a city-by-city basis, and was aired in some areas as early as 1949. It was the first animated series to debut on TV. The Crusader Rabbit property was eventually sold to other producers, and Anderson got out of the animation business. Ward retained ownership of everything the studio had in development, including an animated ensemble show based in the mythical town of Frostbite Falls, Minnesota. That one eventually metamorphosed into Rocky & His Friends, which debuted on NBC in 1959. Excellence in animation was never the studio's strong point. Crusader Rabbit was virtually nothing but a series of still drawings, and Rocky's show was no prize production either. What makes them stand out is the wit that went into them. Ward strove to reach three audiences, on three different levels — pre-verbal youngsters, who could enjoy the sounds and colors; kids who could appreciate a storyline with fast-moving events piled one on top of another; and adults, for whom the clever wordplay and wry commentary were intended. He succeeded on all levels — not so well that the shows were wildly popular, like some of the contemporary Hanna-Barbera productions were, but quite enough to develop a loyal fan following, which they retain to this day. Jay Ward Productions continued turning out fabulously inventive cartoons for the next few years. While its following was enthusiastic, it was not, by network television standards, very large. Series proposals such as "Fang the Wonder Dog" and "Hawkear" (about an Indian scout of the Old West) went unproduced, because the networks wouldn't accept them without emasculatingly massive changes. 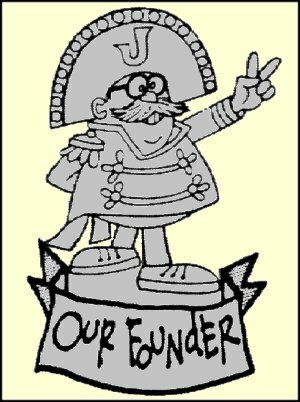 The studio came to rely more and more on its commercial work, particularly for Quaker cereals — first, with its regular characters acting as spokestoons for existing products, and later with new products based on Ward-designed characters (such as Quisp, Quake and Cap'n Crunch). Jay Ward and Bill Scott are both dead now — but Jay Ward Productions is still around, selling character merchandise through its Dudley Do-Right Emporium in Los Angeles. It also continues to sell its old cartoons as TV reruns, and to license the characters in new productions — for example, live action features starring Boris & Natasha (1992) and George of the Jungle (1997). Even today, these reruns and new productions aren't mega-hits in terms of sheer numbers. But the fact that they continue coming out attests to the loyalty of the studio's aging fan base. And the fact that the characters continue to pick up new fans, who appreciate an intelligent sense of humor, ensures they'll stay in the public eye for a long time to come.